Loet Vanderveen (1921–2015) was born in Rotterdam, The Netherlands, where throughout his childhood he frequented the local zoo. He was a familiar face among the staff, who allowed him to assist in their caretaking duties. The zoo served as daily entertainment for the young Vanderveen. It was also where he developed his dreams of traveling abroad — to Africa, in particular — along with his deep appreciation for wildlife, which became the primary subject of his later bronze sculptures. The German invasion of Rotterdam during World War II brought an abrupt end to Vanderveen’s zoo visits, and he was devastated when, in preparation for the bombardment on May 14, 1940, the Dutch army killed all of the zoo’s dangerous species in an attempt to minimize the chaos that might ensue. “It bothered me that the animals were shot,” he said, “but with the German occupation, I began to see much more horrible things, human suffering.” Vanderveen, of Jewish descent, escaped the Nazi-occupied territory through Belgium, though he was later captured in France for three weeks. Following his release, he joined the Dutch Army, and then, the Royal Air Force. He later received a medal of valor from Queen Wilhelmina of The Netherlands. 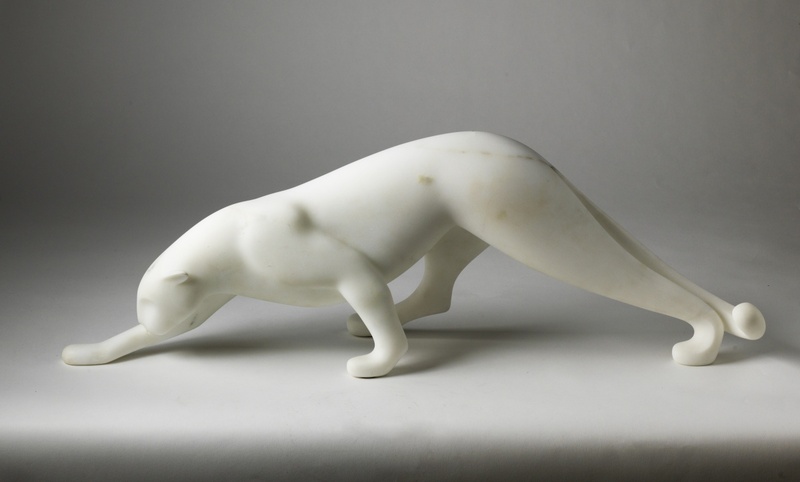 Loet Vanderveen, Stalking Cheetah, 1988. Bronze with patina, 8 x 14 3/4 x 5 in. Crocker Art Museum, Loet Vanderveen Collection, 2016.60.35. After the war, Vanderveen spent brief periods in Zurich, London, and New York, pursuing a career as a fashion designer. In New York, he met Fong Chow, an accomplished ceramist and curator of the Far Eastern Department at the Metropolitan Museum of Art. Fascinated by clay and the complex art of glazing, and growing weary of the fashion industry, Vanderveen took private lessons with Chow for three years. In 1959, Vanderveen settled along the coast of Big Sur, California. His home and studio — designed by Mark Mills, an apprentice to famed architect Frank Lloyd Wright — offered respite from the city and gave him the opportunity to focus on his ceramics. He transitioned from vessels to, in his own words, his “Biddy Period” of satirical figures imbued with cheeky humor that capture the nuances of human interaction. Frequently described as “stylized” for their streamlined surfaces and absence of detail, his sculptures have a timeless appearance. Vanderveen also began sculpting animal figures, first in ceramic, then in ceramic with bronze parts, and then almost exclusively in bronze. He is today known for his remarkable ability to capture the subtle expressions and gestures of animals with minimal detail, using his own observations — often from travels abroad. In Vanderveen’s work, antelope graze, elephants run in herds, and cheetahs stalk their prey. In their streamlined surfaces and absence of detail, these sculptures have a timeless appearance, often bearing similarities to the ancient objects Vanderveen collected on his trips. The majority of his collection of art from Africa, Burma, Central America, China, India, Indonesia, New Guinea, and Thailand is today part of the Crocker’s permanent collection. In the summer of 1985, Vanderveen’s residence was one of eight homes destroyed by the 1985 Rat Creek-Gorda Complex wildfire, which raged for two weeks in Monterey County and scorched 55,889 acres. Undeterred by the loss — one of many personal tragedies Vanderveen endured — he rebuilt his home and a smaller studio and continued working daily on his bronze sculptures, which became admired and beloved by collectors around the world. Vanderveen remained on the Monterey Peninsula until the end of his life, dividing his time between his home in Big Sur and a condominium in Carmel. He died in 2015 at the age of 93. Modern Menagerie: Sculpture by Loet Vanderveen is on view at the Crocker Art Museum, December 09, 2018 — March 31, 2019.